Everyone knows that Google lets you search billions of web pages. But few people realize that Google also gives you hundreds of cool ways to organize and play with information. Since we released the last edition of this bestselling book, Google has added many new features and services to its expanding universe: Google Earth, Google Talk, Google Maps, Google Blog Search, Video Search, Music Search, Google Base, Google Reader, and Google Desktop among them. We've found ways to get these new services to do even more. For those of you concerned about Google as an emerging Big Brother, this new edition also offers advice and concrete tips for protecting your privacy. Get into the world of Google and bend it to your will! Rael Dornfest is Chief Technology Officer at O'Reilly Media. He assesses, experiments, programs, fiddles, fidgets, and writes for the O'Reilly Network and various O'Reilly publications. Rael is Series Editor of the O'Reilly Hacks series and has edited, contributed to, and coauthored various O'Reilly books, including Mac OS X Panther Hacks, Mac OS X Hacks, Google Hacks, Essential Blogging, and Peer to Peer: Harnessing the Power of Disruptive Technologies. He is also Program Chair for the O'Reilly Emerging Technology Conference. In his copious free time, Rael develops bits and bobs of freeware, particularly the Blosxom weblog application, is Editor in Chief of MobileWhack, and (more often than not) maintains his Raelity Bytes weblog. View Rael Dornfest's full profile page. Paul Bausch is an independent web developer living in Corvallis, Oregon. When he's not hacking together web applications, he's writing about hacking together web applications. He is the author of Amazon Hacks for O'Reilly in 2003, Yahoo! 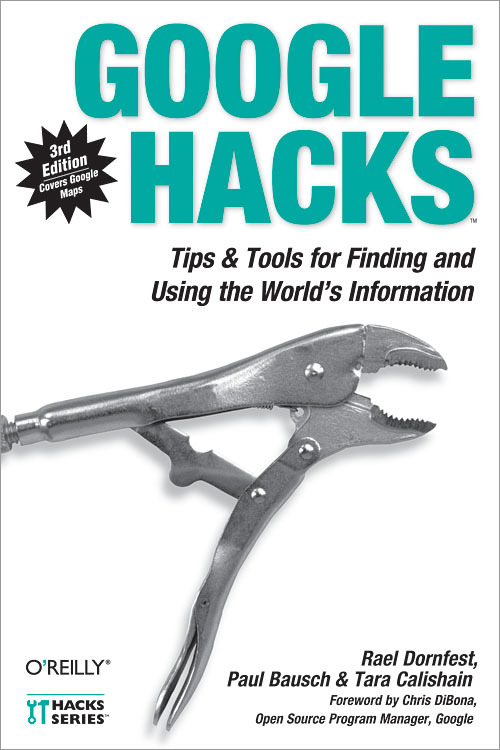 Hacks in 2005, and co-wrote Flickr Hacks in 2005. Paul also helped create the popular application Blogger (http://www.blogger.com), maintains a directory of Oregon blogs called ORblogs (http://www.orblogs.com), and co-wrote a book about blogs called We Blog (Wiley). When he's not working on a book, Paul posts thoughts and photos to his personal blog onfocus (http://www.onfocus.com). View Paul Bausch's full profile page. Tara Calishain is the creator of the site, ResearchBuzz. She is an expert on Internet search engines and how they can be used effectively in business situations. View Tara Calishain's full profile page.